Most boxed/pre-packaged quinoa has already been pre-rinsed for convenience, and cooking instructions therefore suggest only a brief rinse before cooking, if at all. If quinoa has not been pre-rinsed, the first step is to remove the saponins, a process that requires either soaking the grain in water for a few hours, then changing the water and resoaking, or rinsing the quinoa in ample running water for several minutes in either a fine strainer or a cheesecloth. Removal of the saponin helps with digestion; the soapy nature of the compound makes it act as a laxative. One cooking method is to treat quinoa much like rice, bringing two cups (or less) of water to a boil with one cup of grain, covering at a low simmer and cooking for 10–15 minutes or until the germ separates from the seed. The cooked germ looks like a tiny curl and should have a slight bite to it (like al dente pasta). As an alternative, one can use a rice cooker to prepare quinoa, treating it just like white rice (for both cooking cycle and water amounts). Quinoa can serve as a high-protein breakfast food mixed with honey, almonds, or berries; it is also sold as a dry product, much like corn flakes. Quinoa flour can be used in wheat-free and gluten-free baking. 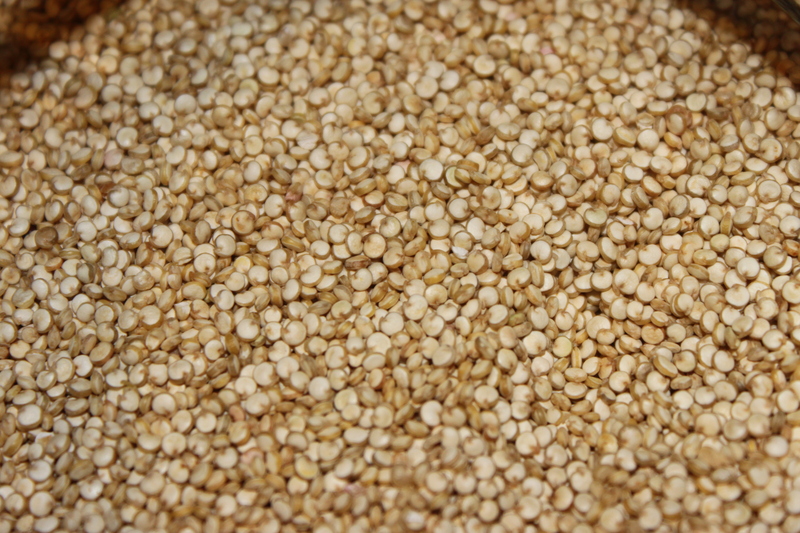 Quinoa may be germinated in its raw form to boost its nutritional value. Germination activates its natural enzymes and multiplies its vitamin content. In fact, quinoa has a notably short germination period: Only 2–4 hours resting in a glass of clean water is enough to make it sprout and release gases, as opposed to, e.g., 12 hours with wheat. This process, besides its nutritional enhancements, softens the grains, making them suitable to be added to salads and other cold foods. We have some great recipes planned! Check back soon!